Sometimes something is just so awe inspiring you have to put a colander on your head! 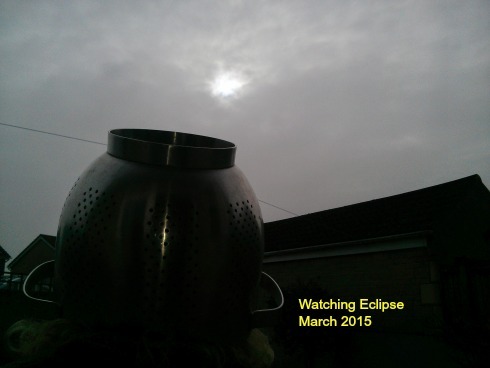 The recent solar eclipse looked like it would be obscured by cloud in the West Country in UK but I kept a watch with my colander to hand just in case. And suddenly a tiny gap in the clouds appeared and we saw the whole thing. Yes, I know I look weird with a huge colander on my head but sometimes it’s worth it. Something so amazing really gives you a sense of perspective, of just how small we are, and how much time we have to get on with life. Take your chances when you can, for who knows what tomorrow will bring. Live life to the full! P.S. Photo is courtesy of my husband who was laughing so much I’m amazed he got it in focus!